The village of Bodhgaya situated near the river Niranjana, 12km from Gaya in the state of Bihar isthe most important Buddhist pilgrimage centre and attracts Buddhists from all over the world. It is the place where Lord Sakyamuni (Gautam Buddha) entered into meditation after being moved by the sufferings of mankind and attained enlightenment. The original 'Bodhi tree' or Pipal (Ficus religiosa) - the tree of awakening; was said to have been destroyed by Mauryan emperor Ashoka. The giant Bodhi Tree (Peepal) seen here is believed to have grown from the original Bodhi Tree under which, sitting on the raised red stone platform, 'vajrasila', Prince Siddharth meditated and finally attained Nirvana. The platform has a stone carving of his footsteps where the devout make flower offerings. Then there is 'Chaukramana', the Jewel Walk, where it is believed that the Buddha strolled while in deep thought and 'Animeshlochana' is the sacred spot where Buddha stood to gaze in gratitude at the Bodhi tree for a week. 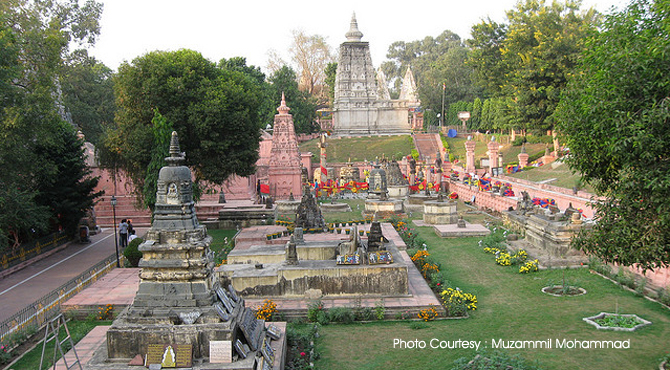 The magnificient Maha Bodhi temple in Bodhgaya is an architectural amalgamation of many cultures. Originally believed to be small shrine erected by Emperor Asoka in the 3rd century B.C, temple was later restored in the 11th and 18th centuries. The temple bears the stamp of the architecture of the Gupta Dynasty and subsequent ages. On the walls of the temple, one sees Buddha carved in different aspects, and in the sanctum sanctorum, a colossal Buddha, is seen touching the ground, which has mythological significance in the Buddhist lores. The temple has a 54 meters high pyramidical spire and an ornamental arch way at the entrance. The temple carries inscriptions recording the visits of pilgrims from Sri Lanka, China and Mayanmar in the 7th and 10th Centuries A.D. Hieun Tsang, the Chinese traveller, also visited the temple in the 7th Century. South of the temple 3 kms. away is a lake close to the village Mucharim. Muchalinda, the multi-hooded snake king guards the lotus in the gardens. The legend is that Muchalinda protected the Buddha against the thunder and rain sent by the asuras and demons, to disturb his meditation. As Gautama sat in deep meditation, Mara, Lord of Illusion, perceiving that his power was about to be broken, rushed to distract him from his purpose. The Bodhisattva touched the earth, calling it to bear witness the countless lifetimes of virtue that had led him to this place of enlightenment. When the earth shook, confirming the truth of Gautama's words, Mara unleashed his army of demons. In the epic battle that ensued, Gautama's wisdom broke through the illusions and the power of his compassion transformed the demons' weapons into flowers and Mara and all his forces fled in disarray. Pilgrims from Tibet, Thai, Bhutan, Japan, China and Burma have built their own temples and monasteries in their own style of architecture. A 20 meters tall Buddha statue built in stone can be seen at the end of the road, beyond the Japanese temple. The archaeological museum here houses a collection of terracotta and stone statues of the Buddha dating to 1st cent. B.C. and also samples of carved railings with lotus motifs and designs. Bodhgaya is also famous for the various meditation courses offered by a number of institutes, usually during October - February in and around the town.